To be fair, in our weekly SMCHAT discussions, we’ve been exploring some similar questions .. though we’d claim it’s been with rigor, applying energy to frame specifics, and to vet our takeaways. But let’s face it. Lots of people are trying to get their hands around the new technology. The answers are needed. What we’ve learned, however, is that ‘solving for SM’ can’t be reduced to a simple formula. Sure, it’s fundamental to engage, and to be authentic. Those are universal basics. But there’s also a variety of usage scenarios that cross a range of organizational contexts. The dynamics of using social technologies can vary quite a bit .. all the way down to selecting the best tools and metaphors .. depending on these scenarios. To illustrate the point, here’s a quick snapshot of the results from our brainstorming over the last several weeks. 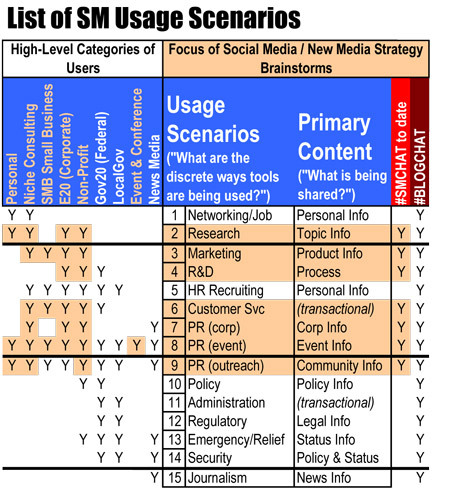 For more viewable detail, check out the SM Usage Scenarios in pdf format. Like everything we do at SMCHAT, we’re going to attack the problem head on, to try and wrestle it down. But this one may be our nemesis. With a quick glance, it’s clear: there are many contexts to consider, a range of content types, and (as shown in the PDF) a diverse set of audiences. The many to many to many mapping can get a bit crazy. Welcome to social media. Or in some quarters, its now ‘new media’ .. more proof of the variability of requirements across venues. The semantics of “2.0” can be a daunting exercise, no? We’re going to use charts like these to get our bearings, as we plan the scope and scale for SMCHAT in 2010, already in progress. But if there’s one thing we CAN take away from this analysis already, it’s this.